Hardware quick installation manual, for the kits with the ‘T’ adapter. Hardware quick installation manual, for the kits with oil filter sandwich plate. Software quick installation manual: Android application. – Are the 6 and 12 Volt vehicles supported? Yes. The maximum battery voltage is 28V. – Are the cars with the negative ground supported? Yes. Please specify this option on when ordering in order to select the correct wiring. – What is the connection type between the phone and the unit? – What is the maximum RPM and numbers of cylinders? The maximum supported RPM is 10000 RPM, 12 cylinders engine. – How do I get the best Bluetooth connection? Avoid metal pieces close to the top of the unit enclosure. At least 30mm clearance is ideal. Avoid big metal objects between the unit and the phone. A metal sheet (firewall) is OK.
– Can the unit be mounted in the engine bay, is it waterproof? The unit is designed and produced as an automotive compliant device. It is waterproof, oil proof, heat resistant up to 80C. Please mount the unit connector to the bottom side, to prevent water to enter the connector from the wires end. – Is the system compatible with diesel engines? Yes. 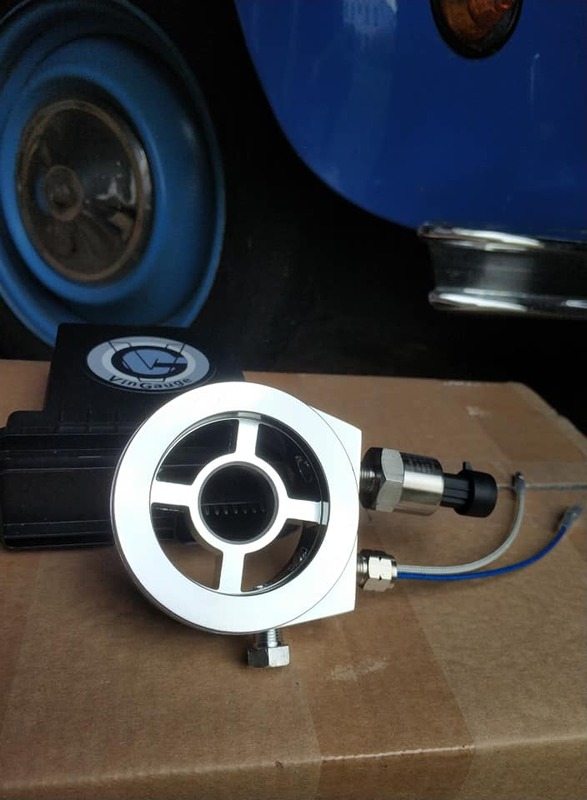 However ther RPM measurement requires an electric connection from the ECU, or a specific RPM sensor on the engine pulley. – Which T adapter do need? Are English cars supported? Please specify the brand, type and year of the car for a correctly sized T adapter. When in doubt refer to the oil pressure switch thread size. Both metric and imperial thread sizes are supported. 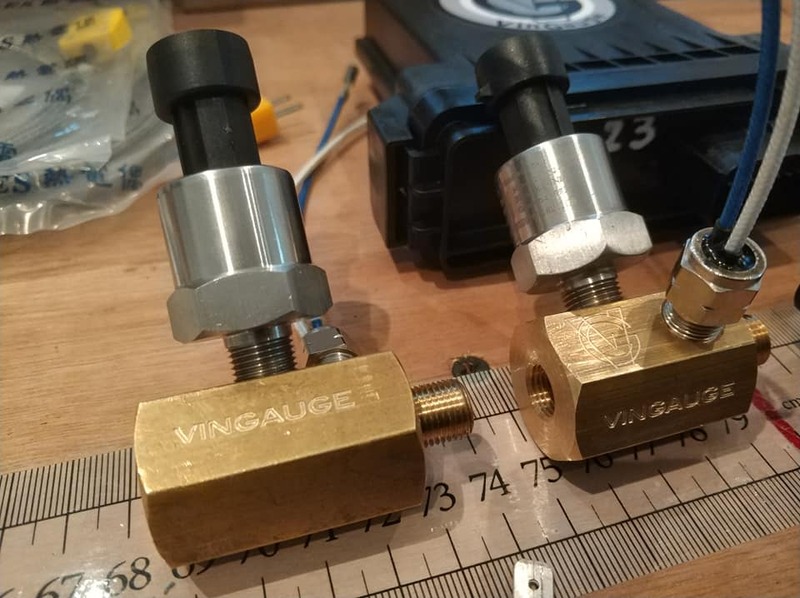 – What is the mounting torque for the sensors and adapters? The maximum torque for the sensors and T adapters is 10 N.m. The maximum torque for the oil sandwich plate is 30 N.m. Note: always verify the oil sandwich plate mounting and torque after changing the oil filter and after a sensor change or re-tightening. – Are the electronic ingition systems supported? Yes. The prefered connection (Green wire) is to the distributor output, or if not available on the coil ‘+’ connection. – Can I change the fuses? Yes. The fuses rating is 5A slow. – Which tablet is best suited? A 7 or 8 inch Android tablet is best suited for the use in the car. – Which tablet support is recommended? A vacuum suction support is best, possibly with a magnetic attachment to the tablet for easy install and removal. – How do I charge the tablet in the car? On 12 Volt systems a USB cigarette lighter adapter is best. On 6 Volt systems a USB battery is recommended. Note: the USB battery tends to shut off at the end of the charge. It is recommended to regularly check the tablet battery level and restart the charge from the USB battery when needed. – How do I install the application? Use Google Play Store on your phone or tablet, locate the VinGauge application and click Install. – How do I update the application? 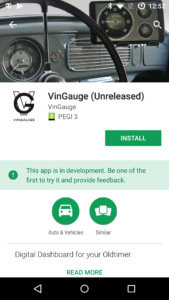 Use Google Play on your phone or tablet, go to ‘My Apps & Games’, locate the VinGauge application. If a new version is available the Update button is visible. Click on Update to update the application. – How do I connect the unit to my Android phone or tablet? Please first pair the unit with your phone on Bluetooth, then start the application. Please refer to the software installation manual for the detailed information. Note: only one unit must be paired to a tablet at a time. – How do I use one tablet in multiple cars? When switching cars, the corresponding unit must be paired. To do so first remove any unit that is already paired and pair the new one. – Is Apple iOS supported? Not for the moment. Only Android devices are supporteds, which gives more choice of screen sizes, brands and prices. ioS is on the ToDo list though. 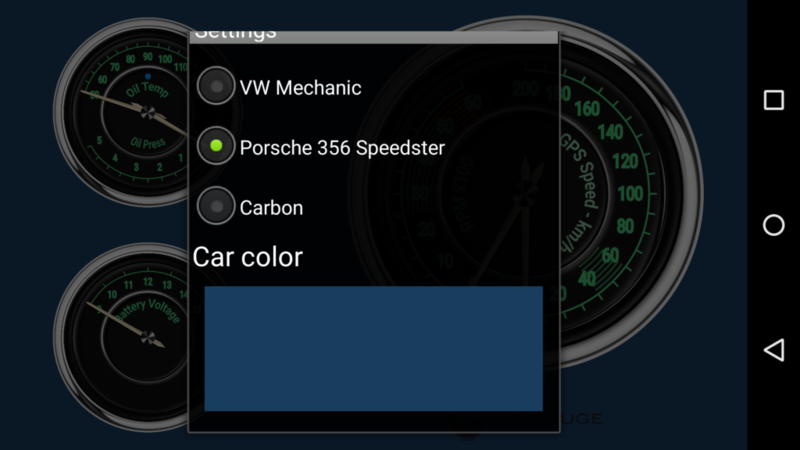 – How do I change the graphical theme to fit my car? Click twice on the background in the app and click ‘Settings’. A list of graphical themes and background color box appear. Make your selection and click outside the settings window to apply the settings. – How do I check the version of the software? Click twice on the background in the app and click ‘Settings’, then check for ‘App version’, ‘Target SW version’, ‘Target HW version’. – How do I check the serial number of the unit? Click twice on the background in the app and click ‘Settings’, then check for ‘Target ID’. – Do I have the data tracking version of the application? Check for the ‘dt’ at the end of the ‘App version’. If not, please send us a message to info@vingauge.com. – How do I sync the tracking data with the cloud? Please connect WiFi or 3G with the application running and let the sync happen automatically. – What is the number of ‘Data to sync’ in the settings? This number is the number of data entries to sync with the cloud. Please connect WiFi or 3G and let the sync happen automatically. This number shall decrease after syncing. – How do I visualize or export the tracking data? Please point your browser to trackit.vingauge.com. You should have a connection user ID and password to log in. – Is the Lambda sensor waterproof? No. The Innovate LC-2 controller unit needs to be mounted inside the car, under a seat or in a luggage compartment. – Why is there a relay to power up the Lambda controller unit? The Innovate LC-2 controller unit uses some power to heat up the Lambda sensor and so it must be powered from the battery via a relay, which is controlled from the contact wire.